Pumpkin soup is big here in NZ, I guess on a similar scale to pumpkin pie stateside. I am not a huge fan of either. I think it a texture thing of me and it is a little too reminiscent of baby food. However, roast pumpkin, for me that is a whole different story. All that wonderful sweetness that I love paired with just a little chilli and salty creamy feta. So from there we get to this satisfying salad, a meal in itself. 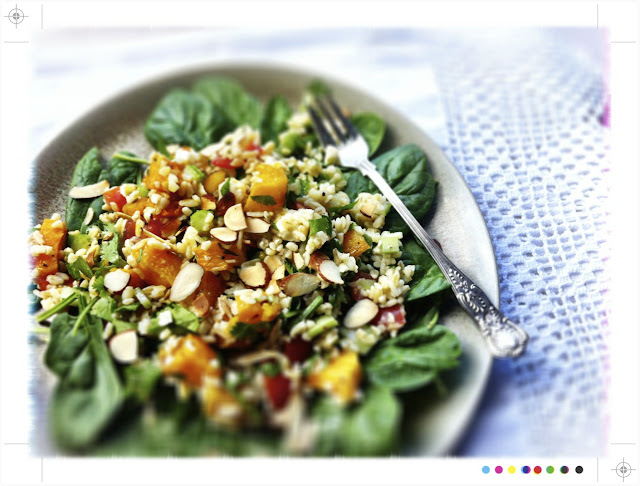 Cracked wheat fills it out along with the sweetest cherry tomatoes and parsley and coriander delivering a fragrant green punch. This is a salad so take the quantities as a guide and adjust to what you have on hand or what you like. If you are not a coriander lover try mint which would also delivery a burst of herby freshness. Place the pumpkin on a baking tray lined with baking parchment. In a small bowl mix together the olive oil, chilli, cinnamon and a little salt and pepper. Pour the mixture over the pumpkin and toss to coat the pumpkin. Roast in the over for 20-25 minutes until the pumpkin is just cooked through and golden as we still want a little texture fro the salad. Remove from the oven and set aside to cool. While the pumpkin is cooking rinse the cracked wheat and place it in a large sized bowl. Pour over enough boiling water just to cover and leave it to it for 15-20 minutes or until all or almost the liquid has been absorbed. 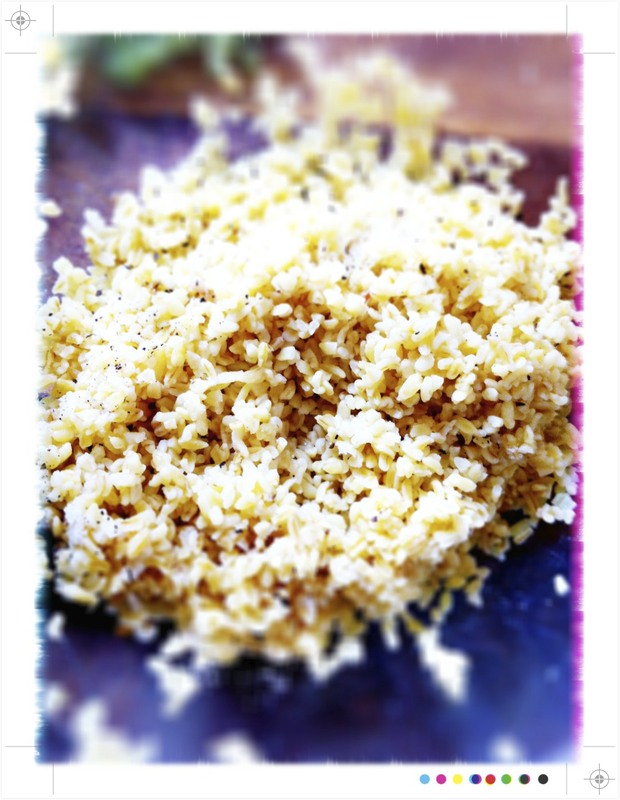 Sieve off any excess water and return the cracked wheat to the bowl and fluff it with a fork. Heat a small frying pan over a medium heat and add the coriander and cumin seeds. Toast for a few minutes until they start to release their aromas. Remove from the heat and pound in pestle and mortar. Add a couple of tablespoons of extra virgin olive oil and set aside. Add the pumpkin, celery, feta, parsley and coriander to the cracked wheat and season with a little salt and pepper. Drizzle over the coriander, cumin and olive oil and stir everything gently together. Set aside for half an hour or so to allow all the flavours to meld and develop. Top with a few toasted almonds and serve on its own or on a bed of baby spinach. 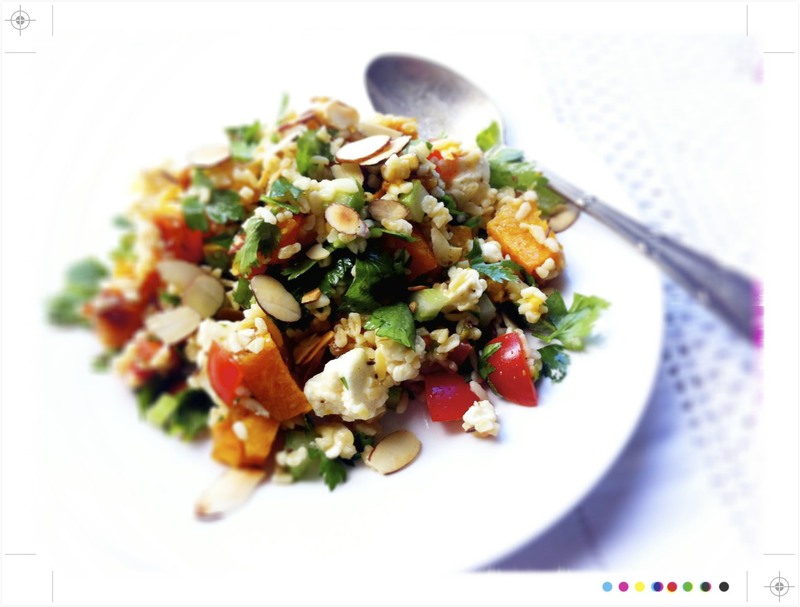 This salad is a satisfying meal in itself the cracked wheat and pumpkin giving it a robustness that will not leave you wanting. The cumin and coriander enhance the nutty like flavour of the cracked wheat that is interspersed with an aromatic herb note from the parsley and coriander. 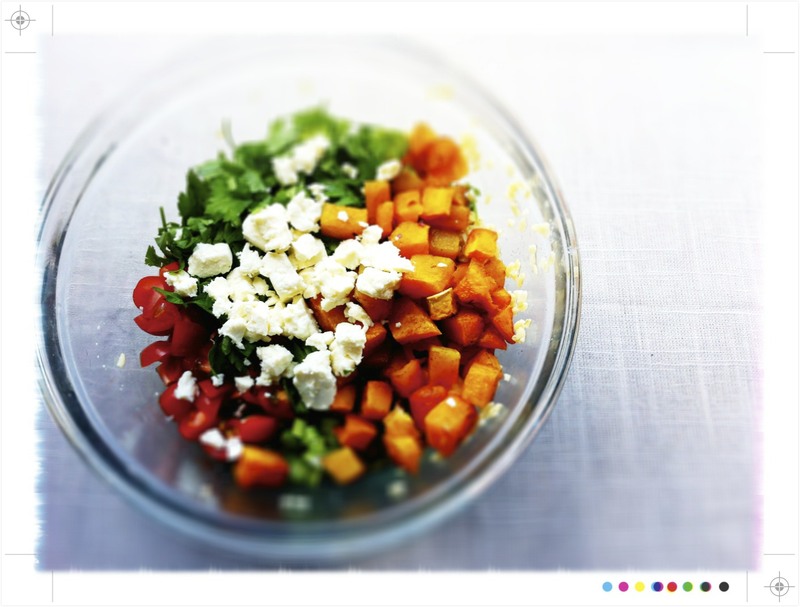 Sweetness from the pumpkin and cherry tomatoes, celery adding a little crunch and to round it all out creamy, salty feta. Not to forget a delightfully toasty crunch from the almonds. Yummy salad! Come and have a look at my place Mairi :-). I'm a big fan of both pumpkin soup AND pumpkin pie. 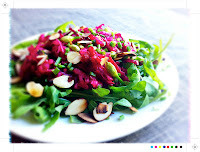 But I also really appreciate it in salads like this one - looks great. Love the spices and almonds, yum!! I love pumpkin - can't get enough of it in soups, salads, roasted or mashed. Have my eye on a pumpkin pie my new baking book - The Art of French Baking. This salad looks lovely too! 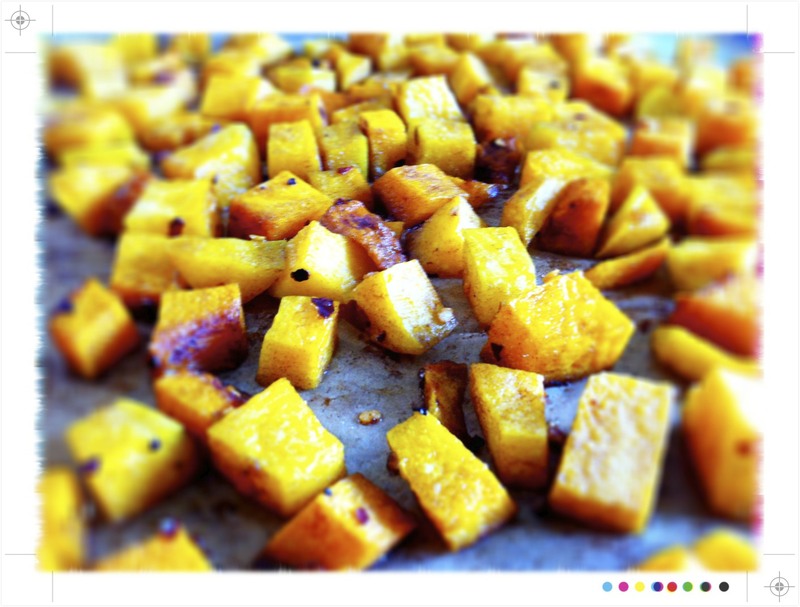 I always appreciate a savory pumpkin recipe. I do love pumpkin pie, but the flavor of unsweetened pumpkin is so good. Lovely salad! 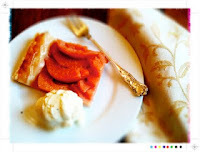 Thanks Hannah,,,,I have had one pumpkin pie that I quite likes, made by American friends of course!